Some say that love is colour blind and more couples here are proving that to be true. Last year, more than one in five of all marriages here - or 22.1 per cent - were between people of different races, a significant increase from the 16.4 per cent in 2007. Last year's figure of 22.1 per cent was more than double the 8.9 per cent of such marriages registered in 1997, data in the Statistics on Marriages and Divorces 2017 showed. The report was released by the Department of Statistics yesterday. Sociologists interviewed say the steady rise in inter-ethnic marriages over the years is the result of two trends. There are more foreigners working or studying here and more Singaporeans are venturing overseas. Secondly, the traditional preference for marrying within the race has waned as people are more educated and liberal in their values and outlook - leading to more inter-ethnic marriages. Sociologist Paulin Straughan of the Singapore Management University said: "The figures give us hope that in terms of racial integration, we are truly a melting pot as marriage is the greatest show of acceptance (of someone of another race). It's also a reflection that marrying outside one's race is no longer a big deal." The figures give us hope that in terms of racial integration, we are truly a melting pot as marriage is the greatest show of acceptance (of someone of another race). It's also a reflection that marrying outside one's race is no longer a big deal. SOCIOLOGIST PAULIN STRAUGHAN, of the Singapore Management University. Percentage increase in the number of marriages last year, to 28,212 from 27,971 in 2016. With more mixed marriages taking place, this has normalised such unions and reduced people's apprehension about going into such a relationship, said Institute of Policy Studies senior research fellow Mathew Mathews. 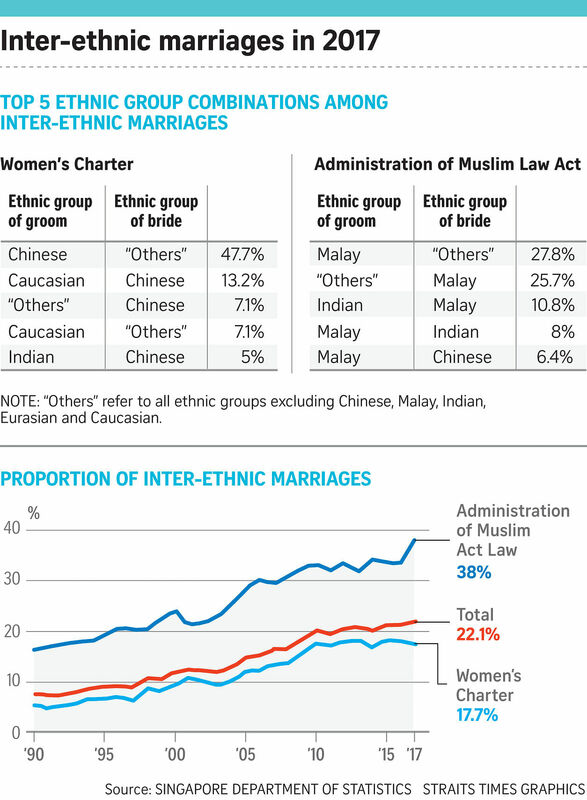 In more recent years, inter-racial Muslim marriages have seen the biggest jump. Last year, 38 per cent of Muslim unions were inter-ethnic, up from 33.9 per cent in 2016. The proportion of such unions in civil marriages saw a slight dip to 17.7 per cent last year, down from 18.2 the year before. And among the civil unions last year, the largest group of those in mixed marriages were Chinese grooms who took brides of the "others" race category. They made up almost half of all mixed marriages under the Women's Charter. The "others" category encompasses ethnic groups other than Chinese, Malay, Indian, Eurasian and Caucasian. Dr Straughan noted that many of the Chinese men who took brides of the "others" category are likely to have married foreigners from neighbouring countries. The men are likely to be older and less educated and may have had problems finding Singaporean spouses, who are known to be more picky in their choice of mates. Overall, slightly more couples tied the knot last year - good news for a country where more people are remaining single and babies are in short supply. There were 28,212 marriages last year, up 0.9 per cent from the 27,971 in 2016. Last year, 7,578 marriages ended in a divorce or annulment, 0.5 per cent lower than the 7,614 marital dissolutions in 2016. In a very modern-day marriage, cinematographer K. Hanshen Sudderuddin, 31, wed interior designer Adeline Yeo, 30, last month. Both are Singaporean, with Mr Sudderuddin of Indian ethnicity and Ms Yeo, a Chinese. The couple met four years ago on a dating website and hit it off. For them, race was never an issue, although Ms Yeo inferred that her parents would have preferred her to marry a Chinese man. They have never voiced their preference, but she pointed out that all her relatives had wed within the race. Still, her parents were supportive of her relationship with her husband. She said: "My parents were very open and welcoming of Hanshen. Times are changing and more people are marrying outside their race." Correction note: An earlier version of this story said the number of inter-racial unions in civil marriages saw a slight dip to 17.7 per cent in 2017. It should be proportion, not number. We are sorry for the error.